For more information, please click on the headings below. 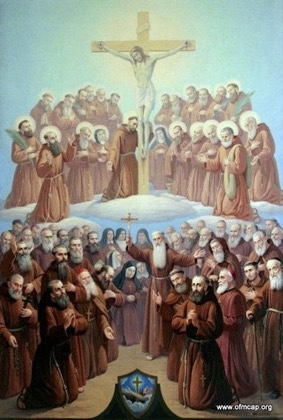 The Saints are people recognised by the Church as having lived the Christian life in an exemplary fashion. But it is important to remember that they were people like us, who faced difficulties and struggled with temptations, as we all do. By the grace of God they were enabled to overcome their own weaknesses and allow the Holy Spirit to rule their lives. The Saints are held up to us not to be put on a pedestal and idolised, but as people who can inspire us and give us courage in our own difficulties. Adulation is never a good substitute for emulation! Philip Latini (who was to take the religious name of Bernard) was born on 6th February, 1605 in the Sicilian town of Corleone. Corleone was a garrison town occupied by Spanish troops. As such places are likely to be, it was a tough place. Philip was the son of Ludovico Latini, a shoemaker, and Bernard was trained in the business. His family was religious and Philip was brought up well instructed in the faith and in its practice. He had a special devotion to Our Lady. One of his brothers, Luca, was described as a "model citizen"; another, Giuliano, became a secular priest. His father, Ludovico, was noted for his generosity and charity. On the death of his father, Philip took over the business, and also inherited his father's spirit of generosity. But Philip had a prickly sense of honour and was quick to react to injustice or insult. Also, like many young men of the time he was accustomed to weapons and was an accomplished swordsman. One day, in 1624, he had a dispute with a man which resulted in the man sustaining a minor injury. The injury to his pride, however, kindled a desire for revenge, and he hired a "bravo" named Vito Canino to challenge Philip to a duel. Philip had no quarrel with this man, but when finally forced into a fight, responded with all his skill. The duel was brought to an end when Philip thrust his blade into his opponent's arm, ending not only the duel but the latter's fighting career. He was crippled for life. This was a turning point in Philip's life. He was filled with remorse. and never fought again. He sought forgiveness from his opponent and eventually they became friends. Philip turned more and more to prayer and reflection on his life and after eight years decided he wanted to be a Capuchin. He was received and took the name Bernard, by which he was to be known for the rest of his life. Bernard devoted the rest of his life to penance. He fasted almost permanently on bread and water and slept for only three hours a night on a board with a block of wood for a pillow. He worked long hours caring for the sick, and, with the passage of time, became known for his gentleness and good humour and courtesy towards all. He was especially devoted to the poor. 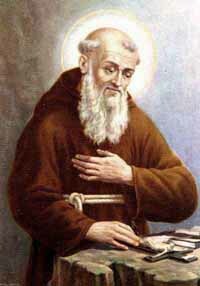 He died in Palermo, Sicily, on 12 January 1667, and was beatified by Pope Clement XIII on 15 May 1768. Pope John Paul II canonized him on 10 June 2001. In the year 1556, at Leonessa in the kingdom of Naples, Italy, a boy was born to John Desideri and his wife, Frances Paulina. They gave him the name Eufranio. John and Frances were devoted parents and brought up their children in the Catholic faith. It was said that even as a child Eufranio fasted. At school he made such an impression on everyone that a nobleman offered him his daughter in marriage, together with a large sum of money. However, the young man had already made his decision and, in 1573, he entered the Capuchin novitiate, taking the name Joseph. In his new life Joseph found what he had wanted - penance. His room was so small and narrow that it was hard either to sit, or stand or lie down in it. He slept on the ground with a block of wood for a pillow. He ate food that had been left over by the other friars, such as mouldy bread or stale beans. After his ordination to the priesthood he was appointed to the work of preaching. His great desire was to go to the Turks to proclaim the Gospel to them. In the year 1587, he went to Constantinople (now Istanbul), the capital of the Turkish Empire, and began work among the Christian slaves who served on the Turkish ships. His activities quickly became known and he was taken prisoner. For three days he was hanged by hooks forced through his right hand and foot while a slow fire burned beneath him. Suffering intensely from his wounds he endured the torment of being half-burned and half-suffocated. On the fourth day he was set free and returned to Italy. There he resumed his former work of preaching and won many people by his great kindness. He was very successful in reconciling people who were living in hatred and bitterness because of past quarrels. In his prayer he was often seen to be totally absorbed in God. He was given the gift of miracles, prophecy and understanding people's secret thoughts. He even foretold the day of his death, 4 February 1612. He was beatified by Pope Clement XII and canonized by Pope Benedict XIV in 1747. John Birndorfer was born in Bavaria in the south of Germany in the year 1818. His parents were small farmers near the town of Parzham. As a young man, he looked for quiet places where he could pray by himself. He had a particular devotion to Mary, the Mother of Jesus, saying the rosary every day, and often walking long distances to visit her shrines. His family lived a long way from the church but that did not prevent him from going to Mass often, even in cold and wet weather. At the age of thirty-one, he made a will in which he surrendered his share of a large inheritance and then joined the Capuchin Order, being given the name of Conrad. After making his profession of vows in 1842, he was appointed to the friary at Altötting, famous for its shrine to Mary, the Mother of Mercy. He was given the job of porter, that is, of answering the door to callers. Since it was not unusual to have hundreds or even thousands of visitors a day to the shrine, his job was a busy one. Conrad continued at this work for 52 years until his death in 1894. It was his responsibility to care for the poor who came to the door, to find confessors who those who wished to confess their sins and to extend a welcome to strangers. He spent a great part of the day walking to the door and back again, always there to be called by the bell. In the evening, when things were a little quieter, he spent his time in prayer before the Blessed Sacrament. It was the same later on and he was accustomed to spend a good part of each night in prayer. His work was often monotonous, while at the same time giving him very little rest. Often when he would be about to sit down for a few moments, the bell would ring again. He tried to find periods of silence during the day so that he could turn to God but it was often impossible. In addition, the help he offered to people was not always well received. One day he gave a man a plate of soup, but, far from being thankful, the man hurled it in his face, saying, "Eat those slops yourself!" In 1881, a serious illness nearly took his life, but he recovered and returned to his old work until three days before his death on 21 April 1894. He was beatified in 1930 by Pope Pius XI and canonized four years later by the same pope. Mark Rey was born at Sigmaringen in Germany in 1577. When he had completed his studies in philosophy and law at the University of Freiburg im Breisgau, the parents of several young noblemen were looking for a tutor who would accompany their sons on a 'Grand Tour' of Europe. The professors at the university drew their attention to Mark whom they considered qualified for the position both by moral and mental gifts. Mark accepted the position, as a result of which he spent six years travelling. To the young men who had been entrusted to his care, he pointed out not only things of cultural interest but matters of spiritual significance also. He himself was a remarkable example. In six years of supervising their travels the young men never once saw him angry. Returning home, Mark followed the profession of lawyer and was soon in demand because of his ability. But he began to be disillusioned with his profession when he saw that some lawyers, corrupted by the desire for money, acted unjustly. On one occasion he overheard some of his colleagues discuss how to prolong a case so as to win larger fees. It was that which finally prompted him to abandon law. Mark had an older brother already in the Capuchins so it was natural that he should think of them. He joined in 1612, receiving the name of Fidelis, meaning the Faithful One. He passed quickly through the study of theology, and after ordination to the priesthood, was appointed to be a preacher. In community he was considered to be a wise adviser and was appointed Guardian after only a few years. In this position he worked hard to promote the Capuchin life. He insisted on the strict observance of poverty, tolerating no violation of it. But he was stricter towards himself than to others, and was especially kind to brothers who were ill. When a disease broke out among the soldiers of the garrison in the town of Feldkirch he personally undertook their care and gave them every service he could. In 1622, the Vatican Congregation of Propaganda Fide, (now known as the Congregation for the Evangelization of Peoples), which had been set up shortly before by Pope Gregory XV, sent Fidelis to the Grisons area of Switzerland to counter the influence of the followers of John Calvin and Ulrich Zwingli. Fidelis had long prayed to God that he would be given the grace of martyrdom. Now his prayer was about to be heard. His work in the Grisons had been so successful that it aroused the hostility and rage of his opponents. One day, as he was preaching in Church, a musket was fired at him and narrowly missed. A Protestant offered to shelter him from a hostile crowd, but Fidelis refused. He was way-laid on the road and beaten and stabbed to death. Fidelis had indeed been faithful until death and received the crown of life. (Revelation 2:10) He was canonized by Pope Benedict XIV in 1746. Ignatius Vincent Peis-Sanna was born in 1701 at Laconi, in Sardinia. As a young man he vowed, during a serious illness, that if he recovered his health he would consecrate his life to God in the Capuchin Order. He regained his health but each day kept putting off the fulfilment of his promise. Then, as if to warn him, his life was again threatened when a horse he was riding nearly threw him when it took fright. Ignatius called upon Saint Francis, renewing his promise and again received help. This time he acted on his promise. He asked for admission at the friary of Cagliari, but the superiors hesitated at first because of his delicate health. Ignatius asked the help of an influential friend, who pleaded with the friars for him, and he was received. 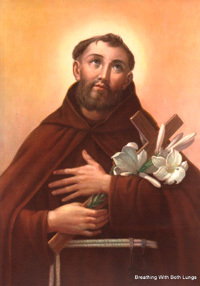 His enthusiasm motivated him so strongly that he was able to attend all the exercises of the community and he was fully faithful to the observance of the Rule of Saint Francis. After working in the friary for several years at various occupations, he was given the job of begging food for the friars. The citizens of Cagliari soon came to see that Brother Ignatius gave them more than they gave him. His gentle behaviour was like a quiet sermon to all who saw him. He spoke little, but when he felt that it was necessary for the salvation of a person's soul, he spoke with exceptional kindness. He would also instruct the children and the uneducated, comfort the sick, and urge sinners to be converted and to do penance. He accepted calmly the mockery and contempt he occasionally received and replied only with kindness. He punctually obeyed his superiors even when they gave him a task that was not what he wanted. In his work he sometimes passed by the house of an extortionate moneylender. He did not ask him for any help for the brothers because he did not want to share in the proceeds of the man's injustice. But when the man complained and the Guardian of the friary told Ignatius to ask him for help, he did so. The man was converted from his former way of life. Ignatius' sister had often written to him asking him to visit her so that she could get his advice. Ignatius agreed to go to see her only when the Guardian told him. But he left again as soon as he had given the required advice. When his brother was sent to prison, people expected that Ignatius would ask for his release because he, Ignatius, was popular with the people. The Guardian sent him to the prison governor, but Ignatius simply asked that his brother be treated with justice. He did not want to influence the governor in doing his duty. Ignatius continued at his work until he was eighty years old. Even after he became blind he still continued for two years to do his daily duty. People's respect for him was very great and sick people were healed by him. He died on 11 May 1781 and miracles occurred at his grave. He was beatified on 16 June 1940 and canonised on 21 October 1951. On 28 May 1886, a boy was born to Pietro Mandić and Carolina Zarević in the town of Herçeg Novi in present-day Montenegro. The parents were ethnic Croats though their country was at that time part of the Austro-Hungarian Empire. The boy was the last of their twelve children and was baptized with the name of Bogdan, a Croatian name meaning 'a gift of God'. He was a frail child and never enjoyed good health. He suffered from various physical deformities: his feet were misshapen, he could never speak properly and he was very short. As an adult he was only 1.35 metres. 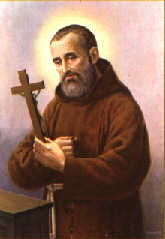 He entered the Capuchin novitiate on 2 May 1884 and was given the name of Leopold. Having completed his studies he was ordained priest in Venice on 20 September 1890. 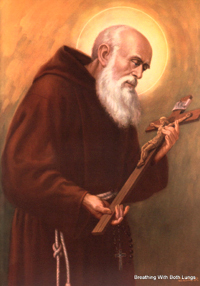 For the first eight years after ordination he was posted to various friaries in the Capuchin Province of Venice. His work was that of confessor, although his hope was that he would be able to return to his own country. In preparation for an anticipated return, he learned Slovene and also Greek. His hope seemed close to fulfilment when he was appointed guardian of a friary at Zara near his home country but this appointment lasted only two years. 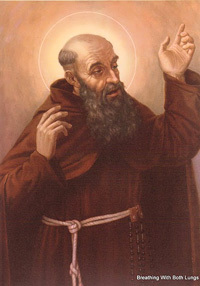 Because of his short stature, his fellow-Capuchins - not very kindly - gave him the nickname of 'The Pocket Edition' He was sensitive about his height and those jokes at his expense hurt him. He had to struggle hard to overcome the psychological problems caused by thoughtless humour. He knew he was pitied or laughed at, and his speech impediment made matters worse. He could not pronounce words properly. He would try with great effort to do so but the words would tumble out in a senseless mumble. It was only by long effort that he was able to pronounce clearly the words of the consecration at Mass or of absolution in confession. He could never preach. On the street he was made the object of practical jokes. Boys would gather round him and fill his capuce (the hood of his Capuchin habit) with stones. "Let them have their fun," he would say, "I'm not much use for anything else." The other sore spot in his life was his nationality. He was a Croat by birth and any insult to his people or language would have him boiling with rage. Although hot-tempered by nature he worked to control his anger. In later years, during the First World War, when he was stationed in Italy, he found himself in an awkward situation. Although Croat by race, language and culture he was technically an Austrian citizen, and Austria was at war against Italy. He was given the choice of taking Italian nationality or of living in internal exile in the south of Italy, well away from the battlefront. He chose exile. His great desire was to work among the Orthodox Christians of his country for their reconciliation with the Catholic Church. He prayed for this intention and took a vow for the purpose, promising, "I, Leopold, before God, in the presence of the Virgin his mother and of all the saints, acknowledge that I am obliged by vow to work for the return of our separated brothers of the East to Catholic unity." He renewed this vow all through his life even though he never had the opportunity of acting directly for its fulfilment. He attributed this sense of being called by God to work for Christian unity to a spiritual experience that he had had on 18 June 1887. He never explained what the experience was but fifty years later he could still recall it clearly. Gradually he came to understand that perhaps what God wanted of him was different from what he had expected. In his own words, "Some time ago I happened to meet and give Communion to a very holy person. Afterwards this person said to me, 'Jesus has told me that your East is in every soul that you help in confession.'" In 1906 he was appointed to Padua where he was to remain for the remaining thirty-six years of his life. He passed largely unnoticed in the community. He was regarded as a good, even exemplary friar, but nothing more. Some of his confreres described him as having a happy temperament, with a good sense of humour, a man who got on well with everyone. But others could see more than that. They saw that he slept for only five hours a day and when not hearing confessions was in the church praying. He seems to have followed the dictum that the first quality of a good confessor is that he should be a good penitent, because he himself went to confession daily. When urged to rest from time to time he replied, "We are called to hard work. We should pray to God that we may die of hard work in the apostolate." His calm and his great respect for people were the qualities that people most noted in him. He was strict with himself, especially in obedience, saying, "Anyone who will not obey can give up hope." Yet he advised his provincial minister, "Try not to load the consciences of the communities with regulations that are not really necessary… You see, regulations are made to be kept, and if they are not truly necessary they are a trap for weaker brethren." He remained a student all his life and often surprised people by how well he kept himself informed of current affairs as well as matters of philosophy and theology. They didn't see how he found time for it, but he did. He was active in promoting the reading of scripture by laypeople and wrote a series of articles for members of the Secular Franciscan Order to encourage and help them to do so. He thoroughly enjoyed a discussion in theology, especially on the works of Saints Augustine, Thomas Aquinas and Alphonsus Liguori or on papal encyclicals. He sometimes surprised his confreres with his opinions. At a time when the rights of trades unions were not well recognized he was asked if he thought it was legitimate for workers to try to improve their situation. He replied, "The fruits of the field are the fruits of capital contributed by the owner, and of work contributed by the labourer. Capital means money, but labour means blood and sweat and life. Which is more valuable, money or life? Life! Well, then, you understand me…"
One of his great burdens in life was his health. In addition to his speech defect, he suffered from arthritis and almost constant stomach trouble. Even when in his seventies he would not allow any heating in the confessional where he spent hours each day, no matter how cold the weather. His explanation was simple: "The poor can't afford heat." The great apostolic work of Leopold's life was the confessional, and it can be stated simply. He spent about twelve hours a day for forty years hearing confessions. He never sent anyone away or complained that the time was unsuitable. At the end of a long day it sometimes happened that he would be just back in his room when the bell would ring again for confession. His answer invariably was, "Here I am, sir! Here I am!" If he had just gone to bed at night and a friar came to him for confession it was the same, "Here I am! At your service!" 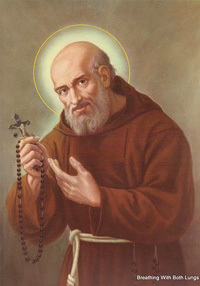 His confreres sometimes criticized him for giving penances that they considered too light, but his answer was that that was the reason why he spent his spare time in prayer. He was saying people's penances for them. He had an extraordinary power of prophecy. Two remarkable instances are on record. On 23 March 1932, a man who came to his confessional found him in a depressed state. He enquired what the matter was. Leopold was reluctant to say anything but finally blurted out twice, "I saw Italy in a sea of fire and blood. Pray God that I may be wrong." Whenever the future of Italy was mentioned in conversation, he would cry and say, "God have pity on Italy." In June 1940 he told his confreres that Padua would be bombed and the church and friary destroyed. Two years after his death, on 14 May 1944, a heavy Allied air raid bombed Padua. The church and friary were destroyed - except for Leopold's confessional. In was in this way that he climbed his Calvary carrying his cross until early in 1942. Then 78 years of age, his health steadily deteriorated and he was confined to bed, but still continued to hear confessions, especially of priests, for whom he had a life-long affection. On 29 July he heard the confessions of fifty priests in his room. At 7 a.m. on the following day, he died. It was a measure of his popularity that, on that day, some 25,000 people streamed through the church to see his body laid out before the main altar. On 31 July, his funeral brought Padua to a standstill as almost the entire population attended. 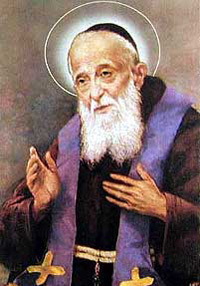 On 2 May 1976, Pope Paul VI declared Leopold Mandić blessed. In 1983, during the Synod of Bishops on the theme of Reconciliation and Penance, Pope John Paul II declared him a saint. Felix Porri was born in the mountain village of Cantalice in Italy's Puglia Region in 1515. As a boy he herded cattle and later became a farm labourer. His heart was attracted to God, and, in the evening after work, he used to spend his time in prayer. He used to regret his inability to go to Mass daily. He was attracted to the religious life but kept putting off a decision. One day, when he was ploughing in the fields, the oxen pulling the plough broke loose and ran wildly. They knocked Felix down and pulled the plough over his body. The neighbours ran out expecting to find him dead but only his clothes had been torn and he himself was unhurt. This incident moved Felix to commit himself completely to God so that, at the age of twenty-eight, he joined the Capuchins. 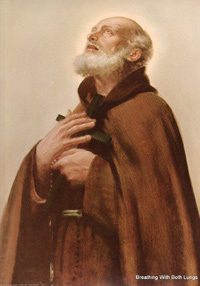 While a novice, he suffered from various illnesses and the friars thought more than once of sending him home, as he seemed unable to live the life. By a great act of will, Felix rose from his sick bed and took a full part in all the normal activities of the friars. In fact, he suffered no more ill health until his death. After his profession of vows, he was appointed to a friary in Rome to be a questor, that is, to beg for food for the brothers. For forty years he went barefoot through the city with his begging bag over his shoulder. The people came to call him Brother Deo Gratias, (Brother Thanks be to God), because he said it so often. He spoke little but what he said was worth hearing. He had a great love for children and used to compose songs for them. He would sing these songs with anyone who came along, including the Jesuit students of a nearby college, and a Padre Filippo, who later became known as Saint Philip Neri. Felix was soft-hearted but not soft-headed. On one occasion people called him to a house to pray for a man who lay in bed and for whom the doctors had given up hope. Perhaps the brother would have a word of comfort for him? Felix looked at the man and called out, "Get up, lazy-bones! There's nothing wrong with you but lack of fresh air and exercise. Out of bed!" The man rose from bed recovered. Nor was he afraid to challenge those in high office. He once said to the Cardinal of San Severino, "My lord Cardinal, you have been appointed Protector of the Order to protect it, not to meddle in matters that belong to the superiors." To Cardinal Montalto, who had been a friar, on the eve of a papal election, he said, "If you are elected pope, act as pope for God's glory and for the good of the Church; otherwise you would have done better to have remained a simple friar". The Cardinal was elected pope a few days later and took the name of Sixtus V. He is known to history as a reformer. 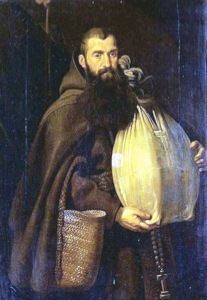 Once, when plague and famine struck Rome, Felix gave away to the poor much of what he had collected for the friars. The Guardian of the friary objected, saying that there would be nothing left for the brothers if Felix kept this up. But Felix replied, "Do you think that the friars will starve if the poor are fed? Believe me, if the poor are fed, the friars will not go hungry." And he got his way. He had a great love for Mary, the mother of Jesus, and he prayed to her for several hours each evening. It was even said that she appeared to him and placed the child Jesus in his arms. He used to commend to her care the people who provided food for the friars. give back my heart to me. Felix died on the feast of Pentecost, 18 May 1587. He was beatified by Pope Urban VIII in 1625 and canonized by Pope Clement XI in 1712. 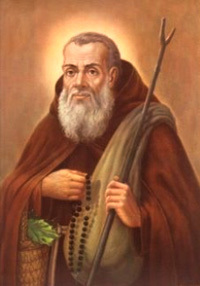 From the beginning of the Capuchin reform in the early sixteenth century, Felix has been regarded as the friar who best embodied its spirit. His Feast is celebrated on May 18. "Cross of Christ on my forehead, Word of Christ in my mouth. Love of Christ in my heart!" "Eyes on the ground, heart in heaven. rosary in hand." Peter Fioretti was born to a family of storekeepers in Viterbo, Italy, on 13 November 1668. When he was five years old his mother consecrated him to Our Lady and Peter tired throughout his life to be faithful to that wish of his mother's. When he had finished school, he began to learn Latin. He had the ability to learn but his parents had no money to pay a teacher, so the young man went to live with an uncle who was a shoemaker. This uncle taught him the trade and so Peter was able to make enough money to pay for his tuition. One day, seeing a group of Capuchin novices in a procession, he was so moved that he applied immediately to join the Order. He was accepted, and was given the name Crispin, after the patron saint of shoemakers. That was on 22 July 1693. Despite his prior training as a shoemaker, in all his 57 years as a Capuchin, Crispin was never given the task of making sandals for the friars. After professing vows on July 22, 1694, he was assigned to Tolfa, as cook for three years, and then passed through a series of assignments: infirmarian at Rome, cook at Albano, orchard keeper at Monterotondo, and finally, questor at Orvieto for 38 years. Crispin accomplished a remarkable amount of good in the area of social and spiritual assistance, energetically ministering among the sick, the imprisoned, sinners, unwed mothers, families experiencing hardship and those on the brink of despair. He was a skilled peacemaker both within his own Capuchin community and with others. Before beginning any task, Crispin always prayed first to Mary, his mother. He possessed a contagious joviality and his ministry was marked by a profound sense of joy. Nothing escaped his notice, particularly in discerning what people really needed. Daily he visited the sick and local prisoners, pleading their cause, urging the guards to respect their human dignity, bringing them bread, chestnuts and tobacco, and arranging for families to take turns providing the prisoners with good, home cooked meals. Babies were often abandoned on the doorstep of the friary and then placed in the care of Our Lady of the Star Shelter. Crispin took a personal interest in these foundlings, arranging for their being apprenticed in some trade, and keeping in touch with many of them well into their adult lives. Crispin was filled with intuition and insight which prompted many learned people to seek his counsel. Crispin was convinced that much of human misery, both material and spiritual, was due to injustice. He therefore set about to confront social injustice by admonishing merchants, reminding people of workers' rights, and asking forgiveness of debts whenever possible. He used his sense of humor to lighten people's burdens. Every little occurrence found its way quickly to Crispin's ears. Without hesitation, he would offer himself as a mediator, friend, and counselor. Nonetheless, he was not without his critics and crosses, both within and outside the friary. Some called him opinionated and aggressive; others, a hypocrite. Some friars expected Crispin to make their life easier. When their expectations were not met, they became embittered. He died on 19 May 1750 and was beatified by Pope Pius VII on 7 September 1806. Pope John Paul II canonized him on 20 June 1982. Besides many letters, Crispin left a treasury of maxims,e.g. "One doesn't get to Paradise in a carriage"
"Let us love God, who deserves it"
"If you want to be happy in religious community, among other things you must observe these three things: namely suffer, keep silent and pray." "Death is a school for making all the crazy people who are attached to the world see sense." Phillip Amoroso was born at Nicosia, Sicily, in 1715. His parents were poor but they gave their son the gift of faith, a gift that he cherished all his life. As a young man he learned his father's trade, that of making and repairing shoes. By the time he was twenty his parents had died, so Philip applied to join the Capuchins. This request was the first of a series of lifelong encounters with a heavy-handed, unsympathetic authority. His application was refused. He prayed, waited, then asked again and was refused again. This went on for eight years until he was finally admitted on 19 October 1743, whereupon he took the name Felix, after Felix of Cantalice. After making his profession of vows, Felix was sent to his hometown to be questor, that is, to go around begging for food for the friars. His behaviour in this work was quiet, gentle, humble, and of such a kind that all sorts of people asked for his prayers and advice. However, his life was far from easy. He had the misfortune to be stationed in a house that, through some canonical aberration, had the same guardian for twenty-four years. This man criticized and humiliated Felix at every opportunity. Whatever Felix did was wrong, it seemed, in his eyes: either what Felix did, or how or why he did it, or why he had not done something else instead. Many years later, when Felix lay dying, the guardian even criticized him for dying without permission! So Felix asked for permission, and - true to form - the guardian refused it, saying he alone had the authority to decide such matters. When the doctor came he could find no pulse - yet Felix was still living. The guardian said he was waiting for permission to die. As he said the prayers for the dying and pronounced the words, "Go forth, Christian soul…" Felix died. Pope Leo XIII beatified him on 12 February 1888, and he was canonized by Pope Benedict XVI on 23 October 2005. Ursula Giuliani, was born on the 27th of December 1660 in Mercatello sul Metauro, the last of seven daughters born to Francesco Giuliani and Benedicta Mancini. Two of he sisters died in infancy. Her father Francesco was the officer commanded the town's garrison. Both he and his wife were noted for their piety and generosity. Benedicta died in 1667 when Ursula was not yet 7 years old. As she grew Ursula was taken with an great longing for the religious life, and in particular, to join the Capuchin Poor Clares. Her father strenuously objected to this but Ursula had a steely will and would not be budged from her resolution. Eventually her father gave in, and Ursula was received into the Order on 28th October 1677, taking the name Veronica, (from the Latin vera icona, meaning "true image"). It became Veronica's goal in life, to become a faithful image of the Crucified Christ. In her desire to be united with Christ Veronica devoted herself to contemplation and to mortification, indeed pushing her practice of self-denial and penance to extremes which in later life she referred to wryly as "crazy things love made me do." Between 1688 and 1691, and again from 1694 to 1698, she served as Novice Mistress, during which time she tried to teach her charges the virtue of moderation and to avoid the "crazy things" she herself had practiced. On the 12th of December 1693, she began writing a Diary which she was to continue until a few months before her death. In this she describes her spiritual journey from the time she was a child. Her intense life of prayer led her to a deep and intimate connection with Christ. On Good Friday, the 5th of April 1697, she received the Stigmata, the marks of the five wounds of the crucified Christ. Embarrassed by these outward signs, Veronica prayed to be free of them and by 1700 the bleeding in her hands and feet had come to an end, but the blood continued to flow regularly from her side right up until the day she died. Meanwhile, life was bringing her plenty of opportunities for self-denial and mortification without her seeking them. While many of her sisters appreciated her, she experienced hostility and suspicion from others. In 1697, she was denounced to the tribunal of the Holy Office (today's Sacred Congregation for the Doctrine of the Faith) and, because of this, in 1699, she was deprived of her right to vote or to be elected to any position in the Order. This situation was to last until 1716. On the 7th of March 1716 the Holy Office removed the punitive sanctions Sister Veronica had incurred. She was able once more to exercise her active and passive voice and participate in the monastery's elections. A few weeks later the Sisters elected Sister Veronica as their superior and she became Mother Abbess. Mother Veronica fulfilled this ministry the until the day she died. Her fourteen year long term as Abbess were years filled with the blessings of God. While Sister Veronica was a mystic who endured many a hard day due to the pains of her martyrdom of love(and especially that of the wound in her side), nevertheless as a very practical woman she also managed during this time to extend the monastery buildings and improve its rather cumbersome waterworks. On the 6th of June 1727, her sufferings grew more severe. Over thirty days Sister Veronica went through physical, mental and spiritual anguish. At the end she called the novices and young Sisters to her sickbed and said to them. "Come here, for Love has let himself be found: this is the cause of my suffering. Tell the others, tell them all." She then asked them to sing for her a hymn in praise of the Incarnation of the Word, While listening to the singing, she could no longer restrain her weeping and cried out "Who among you would not weep at such Love?" 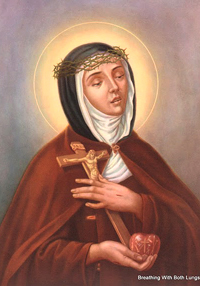 At daybreak on the 9th of July 1727 in the Poor Clare Monastery of Città di Castello Veronica quietly breathed her last. She was beatified in 1804 and thirty five years later in the year 1839 she was canonized by Pope Gregory XIV. Cesare de Rossi was born at Brindisi in Italy in 1559. As a child he displayed extraordinary mental and spiritual gifts. There was a custom in Italy at that time of inviting a boy to give a sermon in church in remembrance of Jesus being found in the temple at the age of twelve. Lawrence gave his first sermon at the age of six! We are told that it was given with such conviction that people were moved to reform their lives. Lawrence entered the Capuchin novitiate at Verona when he was sixteen. From the beginning he was recognized as a man of rare ability and spirituality. He studied for the priesthood at Padua and learned six languages, including Greek and Hebrew. 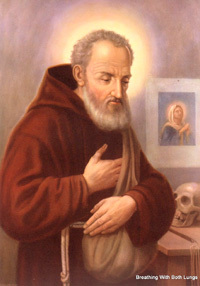 His writings, mostly sermons, run to fifteen large volumes, the most important of which is an exposition of Catholic doctrine on Our Lady, the Mariale. After his ordination he was called on to preach. He quickly became so popular that whenever he went to a town all work stopped. Farmers came in from the surrounding countryside to hear him. His preaching was learned, but it was a learning that was alive with emotion. Sometimes it aroused violent opposition. In later years he had such success in bringing Protestants to the Catholic faith that an attempt was made to kill him. A gang of ruffians tried to throw him from a bridge, while on another occasion they attacked the house where he was staying and shot at the guardian. In his person he was a quiet man with great inner strength. He said little, had a ready smile, but was firm when the situation called for it. In later years, when he was sent to Germany with twelve other friars, including Blessed Benedict of Urbino, to work for the conversion of Lutherans to the Catholic Church, he had some difficulty with the papal nuncio. Without reference to Lawrence who was the friars' guardian, the nuncio had appointed the friars to various offices. Lawrence reminded the nuncio that he, Lawrence, was in charge. He cancelled the nuncio's appointments and made his own. His devotion to the Mass was outstanding. He sometimes became so absorbed in it that he forgot everything else. On one occasion it took him eighteen hours to say it! He remarked afterwards that he had never felt the time passing. In 1601 the large Turkish army invaded the lands of the Holy Roman Emperor and were threatening to overrun the Habsburg-ruled lands before going to Rome to stable their horses in Saint Peter's Basilica. The Pope and Emperor were alarmed and patched together an army to block the Turkish threat. Brother Lawrence's skills as a diplomat were used to cement together a Christian allied force which also included Protestants. At the Emperor's request Capuchins served as army chaplains to the soldiers and Lawrence was among those appointed. However the small and badly equipped Imperial forces were no match for the invading Turkish army which with 80,000 men was more than four times larger than the 18,000 Christian soldiers who tried to block them. At the The Battle of Székesfehérvár in Hungary the hopelessly outnumbered Christian army's field commanders counselled retreat, but Brother Lawrence would not hear of this. Instead he urged the Imperial Forces on to victory, encouraging the flagging soldiers with his fiery words and personally leading the army into the thick of battle with his cross raised aloft for all to see. "Advance! Advance! Victory is ours!" he shouted over and over again and in the end a revitalized Christian army totally routed the Turks. Even the Lutheran soldiers were impressed by this and Brother Lawrence's morale-boosting efforts were deemed pivotal in snatching a surprising last minute major victory over the invading Turkish forces. Lawrence then returned to Italy where he hoped he might serve God in solitude. But a Chapter of the Order elected him General Minister and he accepted the office. During a visitation of the brothers in Germany he succeeded in reconciling the Holy Roman Emperor and his brother, Matthias. On returning to Italy, the people of the south of the country appealed to him for help. Their governor, appointed by King Philip II of Spain was cruelly oppressing them. Lawrence agreed to travel to Spain to plead on their behalf. On arriving in Spain he found that the king was in Portugal so he had to journey again. Meeting King Philip in Lisbon, he pleaded the people's case and the governor was replaced. But all these labours, the endless travel under difficult conditions, changing from one kind of work to another, had worn him down. He died in Lisbon on his sixtieth birthday, 22 July 1619. Lawrence was beatified by Pope Pius VI in 1783 and was canonized by Pope Leo XIII on 8 December 1881. In December 1958, Pope Blessed John XXIII declared him a Doctor of the Church, a title given to a small number of saints whose teaching has made an outstanding contribution to the life of the Church. He was given the title of Doctor Evangelicus. Saint Lawrence is the patron saint of Capuchin students, and the International College of the Order in Rome is named in his honour. Francis Mary was baptized John Evangelist Croese and grew up to be a herdsman in his home village of Camporosso near San Remo. Later he joined the Capuchins in Genoa. He expressed his ideal simply, "I came to the friary to be its beast of burden." For many years he had the task of looking after the sick friars. Then he was appointed to do the work of begging for food. He had the job of questor for forty years. He called at the houses of the rich but more often at the hovels of the poor to distribute to them what he had received. He went into those parts of the city that were notorious for sexual promiscuity and there he was sometimes stoned. When this happened he would pick up the stones and kiss them. Gradually people came to respect him and would ask him to pray for them. He would then say to them, "Go to Our Lady! Pray to her and don't forget to say that poor Brother Francis sent you. She'll help, you'll see." Soon it was reported that he was working miracles, cures and conversions of all sorts. Rich and poor came to seek his advice. He often spent the entire night in prayer before the Blessed Sacrament. In 1866, as soon as cholera was first detected on board a merchant ship which had docked in Genoa, all the other shipping too was quarantined. Nevertheless the cholera epidemic had already spread to the city on 'August the 5th. Despite the warnings of others and overcoming his fears, his own and others' fears, brother Francis Mary, desiring that he be sacrificed as a victim of charity, rushed to be among the sick and offer them help. By the end of August, 232 reported cases of cholera infection had been reported and 130 fatalities had already occurred. On September the 15th, 1866, Brother Francis Mary was infected cholera and two days later he was dead. When an epidemic of cholera broke out in 1866 he knelt before the altar of Our Lady and offered his life to God through her. On 17 September he departed this life and the epidemic ceased on that day. Francis Mary was beatified by Pope Pius XI in 1929 and canonized by Pope Blessed John XXIII in 1962. "Francis of Camporosso was born on 27 December 1804 and died on 17 September 1866. This poor man of Christ was more blessed in giving than in receiving. With bread and advice and consolation, he was ever prepared to minister to the sufferings and needs of all who came to him. His austere and holy life he crowned with the sacrifice he made of himself at the beginning of the epidemic of 1866. The sorrow and gratitude of the people prompted them to immortalize his image in this marble statue." Lorenzo Belvisotti was born in Santhià in Piedmont, Italy, on 5 June 1686. He was ordained a priest of the diocese of Vercelli in 1710. After six years of excellent service to the diocese, he was asked to become parish priest of Casanova Elvo and offered the title of canon. However, he felt that the Lord had other things in mind for him, so, after much prayer and reflection, he declined the offers and applied to the provincial minister of the Capuchins of Turin to be accepted as a novice and given the name Ignatius. During his years as a novice, from 24 May 1716 to 24 May 1717, Ignatius asked for and received no exemptions. He was placed under the tutelage of an ardent young novice who, though not half his age, set about teaching him in an over-zealous manner about the Order, the spiritual life, and even how to say Mass! Ignatius accepted this tutoring with humility and even, perhaps, with a smile. After profession Ignatius was sent to the friary at Saluzzo and was given the office of sacristan. Then, after a short stay as assistant novice master in the novitiate in Chieri, he was sent to “Capuchin Hill” in Turin in 1723. Again he was sacristan, which was no easy job, with 87 priests and no concelebration. In 1731, he was made novice master at Mondovi. There he remained until an illness of the eyes forced him to relinquish the job in 1744. Soon he was well again, and even though he was nearly sixty years of age, he accepted the challenging task of head chaplain to the forces of the king of Piedmont, who were fighting against the invading Franco-Hispanic armies. He was present at the battle of Assietta on 19 July 1747. Ignatius was able to win the respect of both friends and enemies by the sacramental and spiritual care he gave to all, as well as the medical care he administered. Once the war ended, he returned to the regular life of the friars. He was then given the task of confessor and religious instructor to the lay-brothers, who were at that time trained separately from the clerics. It was in this work that he was able both to show and to increase his love for the Franciscan vocation. His natural love and appreciation for the lay brothers was evident in that he did not think twice about lending a hand when he saw that it was needed. Whether it was sweeping floors, or cleaning toilets, or washing dishes, he did his part. Even as guardian, he would do jobs such as questing which were traditionally considered the realm of the lay brother. Very soon people realized that here was a priest who did not stay in the sacristy, but went out among the people, ministering to their every personal need. Ignatius seemed to be everywhere in the city, and at every door, enquiring about people who were ill and giving a blessing to every house. As he advanced in years, Ignatius gave more and more of his time to visiting the sick and the poor in the city of Turin. 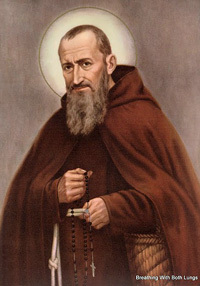 Towards the end of his life, when he could no longer go about so readily, thousands of people flocked to Capuchin Hill daily to receive a blessing from him or to hear a consoling word. He had become their saintly spiritual father. As his health began to fail, he prepared for death with a greater devotion than before. The well-loved friar died a peaceful and gracious death on 22 September 1770. He was aged 84 and had been in the Capuchin Order for 54 years. Pope Paul VI declared him Blessed on 17 April 1966, and Pope John Paul II declared him a saint on 19 May 2002. 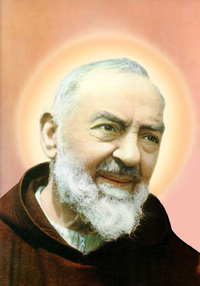 His feast-day is celebrated on 22 September. Francesco Forgione was born in Pietrelcina, a village a few miles from Benevento in southern Italy, on 25 May 1887 to Grazio Forgione and Giuseppa Di Nunzio. He was baptized there in the church of Saint Mary of the Angels the following day. As a child he worked in the family’s fields and tended sheep. He wanted to become a Capuchin, so his father emigrated to America to make enough money to pay for his education. Received into the Order at Morcone on 22 January 1903 while still only 15 years of age, he was given the name of Pio. He made final profession of vows on 27 January 1907. Because of ill-health he was moved from one friary to another and was allowed to spend some of his time at home. However, despite these obstacles he was ordained priest in Benevento cathedral on 10 August 1910. For a time, he was allowed to remain in his own village, where he helped the parish priest as his health allowed. In the summer of 1915, in spite of poor health, he was drafted into the army. Sent home for health reasons on a number of occasions, he was eventually declared fit to serve in 1916 and assigned to an army barracks in Naples. Eventually he was diagnosed with pulmonary tuberculosis and sent home on permanent leave. He was transferred to San Giovanni Rotondo in 1916, and remained there till death. On 20 September 1918, he received on his body the stigmata, the marks of the passion of Jesus. This led to a great deal of curiosity, many investigations, his removal by the Holy See from public ministry and much personal suffering. When he was allowed to exercise a public ministry, he spent most of every day hearing confessions, drawing large numbers of people from all over the world. In 1940 he began the work of building a large hospital in San Giovanni, the House for the Relief of Suffering; it was completed in 1956. In 60 years of religious life, mostly spent at San Giovanni Rotondo, Pio was wholeheartedly dedicated to prayer and to the ministry of reconciliation and spiritual direction. Some days he spent up to fourteen hours in the confessional. Above all else he was a man of prayer. He himself would often say, "I only want to be a poor friar who prays." He talked continuously with the Lord and did not cease from praising God even when his prayers went apparently unheard. In fact, for long periods he endured aridity in prayer and experienced a feeling of having been abandoned by God. Yet he remained assiduously devoted to prayer and spent his day and a large part of the night conversing with God. He would say: "In books we seek God, in prayer we find him. Prayer is the key which opens God's heart." Not only did he himself pray, but he also invited and inspired others to pray with him. "Pray, pray to the Lord with me, because the whole world needs prayers. And every day, when your heart especially feels the loneliness of life, pray, pray to the Lord together, because God too needs our prayers!" Pio died on 23 September 1968. He was declared Blessed by Pope John Paul II in 1999 and was canonized by him on 16 June 2002. Felix de Nicola was born in 1540 at Montegranaro in the Central Italian region know as the Marches of Ancona, around 1540, the second of Jerome de Nicola and his wife Theodora's four children. His father was a builder by trade, but found it hard to eke out a living. At a young age Felix was sent to work on a neighbouring farm, so as to earn some extra income for the family. In the countryside, with only sheep for company, he developed a love for silence, solitude, prayer and meditation. But when his parents died, and his brother Silenzio took over the family business, Felix was called back home to help with the building work. He was, however, a clumsy young man, totally incapable of learning any of the building skills, his brother tried to teach him. Even as a mere hod carrier, his innate clumsiness got the better of him and he was regularly scolded and badly beaten by his bad-tempered older brother. He bore this cruel treatment with great patience. 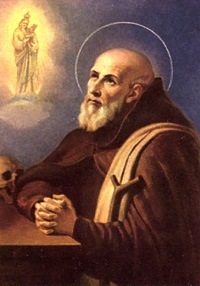 Wanting to consecrate himself to the service of God, he entered the Capuchin novitiate at Jesi at the age of eighteen. He was given the name Seraphin. "I have nothing but a crucifix and a rosary. With these I hope to benefit the Brothers and become a saint." His humility, penance and self-sacrifice impressed his brothers. Punctual in performing his own duties, he still found time to be of service to others. He used to say, "I'm fit for nothing but ready for anything." He often spent nights in prayer. In the evening he would visit the Blessed Sacrament and remain there for hours absorbed in contemplation. Then he would take a short rest, after which he would get up again to attend the midnight Office. During a famine he ate only a quarter of his usual food in order to have more to give to the poor. As doorkeeper, charged with providing for the poor, he once went beyond obedience. One day, there were some poor people waiting for food, and, since he had nothing left to give them, he went into the garden and pulled up the vegetables which were growing there and distributed them. When the guardian criticized him for doing this, Seraphin assured him that the community would not suffer in any way and indeed, they did not go hungry, the shortage being made up in other ways. Holy Mother, pierce me through. Seraphin died on 12 October 1604 at the age of sixty-four. Pope Clement XIII canonized him in 1767.